Somebody once said that the beauty is in the details. That ‘somebody’ must have been married at Brympton House. Described by Christopher Hussey, one of the UK’s leading authorities on British architecture, as “the most incomparable house in Britain” in the 20s, this building remains unrivalled in its grandeur and charm, and is a desirable venue to hold a wedding in Somerset - a county characterised by its classic country houses. Brympton House sits in 33 acres of grade II garden and overlooks a stunning lake, the scenery is a sweetshop for wedding photography, with the entire building made of local hamstone and every regal room an opportunity to capitalise on incredible available light and tone. A conversation by an open fire, the light as it hits the grand piano... you might like to read a little about my natural style of wedding photography. It’s the detail that has gone into the rooms, and the backdrop they offer weddings all through the year that truly makes this a desired location. You can dine with your guests in the Ball Room overlooking the lake in summer, or opt to eat by candlelight in the State Dining Room in winter. Guests can have an intimate drink in the library bar, or wow you with their moves on the dance floor in the old Stables. There’s outside space for a marquee too and a gorgeous terrace if you’re planning to celebrate your day in the sun. Brympton House even has its own Cake Room (Yes, really!) where you can showcase that cake you’ve spent so much time and money on perfecting. For an extra special weekend, there’s also the possibility to hire Bell Tents for you and your guests to sleep in, the staff at Brympton will bring you a flask of hot chocolate when you tuck in at night. Those details. All about the details. Getting married at Brympton House? Have a little look at my previous Brympton House wedding photography to get a better feel how I’ll capture your day. If you’re planning a wedding in the Somerset area, do get in touch. If you’d like the whole day to be spent on the grounds, your ceremony can be held inside the Castle House, and I’d recommend it. 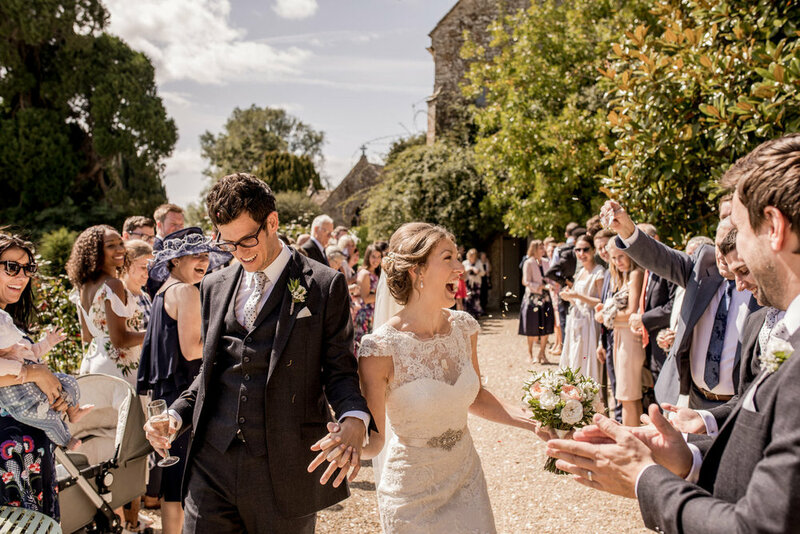 You’ll feel as though you’ve stepped into a Jane Austen novel when you walk down the aisle of this medieval building - with mellow light from the arched windows and wooden pews adorned with flowers. It’s pretty stunning. I’m often described as a ‘reportage wedding photographer’ or ‘documentary wedding photographer’. This simply means that I’ll capture your day discreetly, without dictating or asking you to pose, a photo style that uses the natural light the location has to offer. I get in the heart of the action but in an unobtrusive manner, telling the story of your wedding day as we go along, capturing natural and often intimate moments.